who wounded those children? Who treated their wounds? I recognize that water bottle as one of the many that I have handed out. I am no fan of Richard Land nor am I a blind supporter of any war but I am a little offended. Are you suggesting that American GIs are maliciously wounding children? 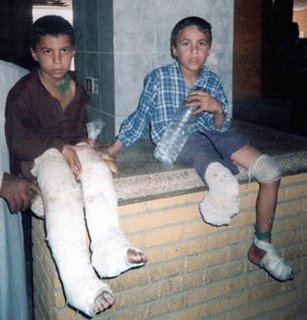 There were children being murdered and orphaned in Iraq before the war. Most of the IEDs, suicide bombings and assasinations are being committed against civilians. Jorge: Thanks for your comment. I do not have information on the photo but used it as a representative one of what has happened the last few years. Glad to hear you have been handing out water bottles. Such loving actions are clearly needed. I truly hope you come back safe and sound! You are correct that there were people killed before the war, but the rates have drastically increased. You are also correct that most of the attacks are being committed against civilians—which is exactly why it is wrong. By the way, now we know several American soldiers knowingly and purposefully bound and killed an innocent Iraqi man. How is that for noble? I know they are bad apples that do not represent the vast majority of our troops, but they are why we cannot paint with a broad stroke as Land did. Jorge: Consider this new report out about a study that estimates that 655,000 more Iraqis have died than would have had we not gone to war. Unfortunately, it does seem that things are worse than they were before.